If you’re looking at a secondhand RV, do you really have an accurate idea of what it’s worth? Determining actual RV values is a tricky business. Such guides as the Kelly Blue Book for RVs are only modestly useful when RV values fluctuate up and down so much due to the economy. Is your local RV dealer’s lot filled with excessive inventory? What’s the economy in your area like? Is anybody buying RVs at all? Is your RV a popular make and model? Are people looking for what you have? If you plan on selling it at the end of your driveway, do you have plenty of traffic passing by? These and other factors can impact what your RV is really worth. Your RV is only worth what someone else is willing to pay for it! Another useful way to determine your RV’s actual value is to compare it to similar RVs that are already available for sale. Just remember, an RV that’s for sale isn’t the same as one that actually sold. 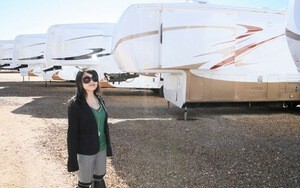 If RVs have been sitting on the lot for a while, they may be overpriced for the current market. This short video gives you an idea of how RV dealers price their RVs. Don’t believe the price in the window; it means practically nothing when it comes to true RV values.